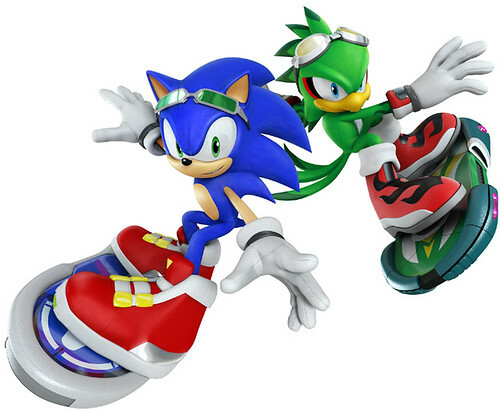 Sonic Free Riders brings full body motion controlled fast-paced boarding action into people’s homes! SEGA Europe Ltd. & SEGA America Inc., today announced Sonic Free Riders. Set for release Holiday 2010, Sonic Free Riders offers an extreme fast-paced boarding game and is developed to take full advantage of “Kinect” for the Xbox 360 video game and entertainment system from Microsoft. For the first time ever in a SEGA game, full-motion body control will allow you to twist and turn your way through a range of visually stunning courses in an action-packed Sonic experience unlike any other! “Kinect’s” unique motion sensor means Sonic Free Riders will see family and friends controlling their fully customisable hover board or bike by twisting, turning and jumping in an exhilarating race to be the first to cross the finish line! Choosing from one of your favourite Sonic characters, or your own Avatar, you can reach out and grab a variety of pickups along the course. By throwing, shaking, or swinging your arms to launch your weapon, you can gain the competitive edge over your rivals in high octane single or multiplayer races. Sonic Free Riders will be available to play with “Kinect” for Xbox 360 for Holiday 2010.